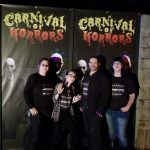 Carnival of Horrors is a Haunted Attraction located in Cuyahoga Falls, OH. Team Jefferson Starship reviewed this attraction on October 6, 2017. It’s October and that means that the Carnival has returned to town. This carnival, however, is staffed by crazed, killer clowns and they’ve dragged along an asylum full of mental patients (of which you may soon become a resident). 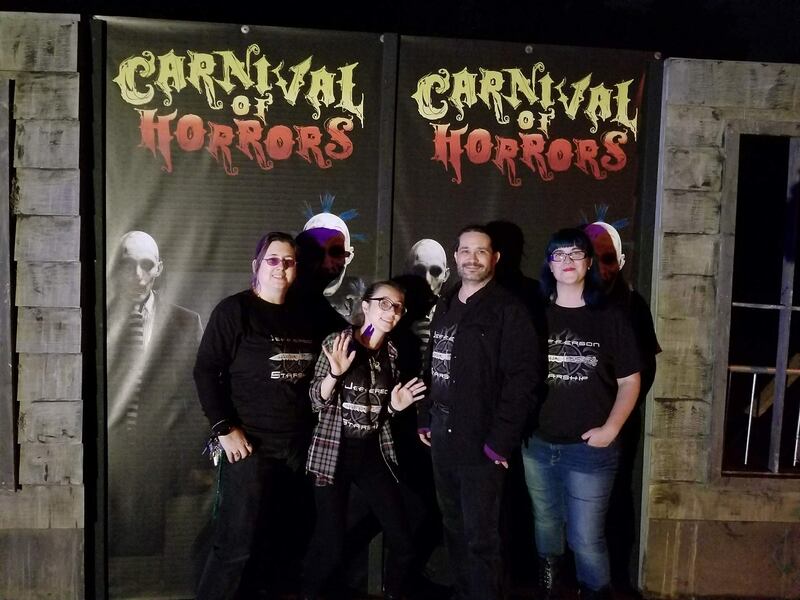 Built on the grounds of a large music entertainment venue, the Carnival of Horrors consists of four small internal attractions – the Fun House, Wicked Woods, Insane Asylum, and Freakshow in 3D. If you (or a friend of yours) is scared of clowns, then the Carnival of Horrors is the place to terrify you down to your soles. Clowns. The Carnival is filled with clowns – clowns in masks, clowns in makeup. There was some great interaction with some of the clowns scattered through the site. Too, the cast did a good job of presenting variations on the clown theme across the Carnival without falling into tired tropes. There were some fresh takes on clowns that were entertaining and surprising. The clowns in the 3-D house were particularly good. Some of the actors across the site were great at misdirecting visitors. It must be said when referring to the walk from the parking lot to the ticket booth to the first attraction entrance – this long walk could use a few more haunters, but during less busy times, this isn’t as much of an issue because there is far less of a wait. We especially would like to call out the queue line clown who had his own musical accompaniment. Not only did this actor stay in-character, but he migrated throughout the queue-lines for the haunt from beginning to end and was quite entertaining. There are nearly a hundred actors spread across the Carnival of Horrors. Though a significant portion of these are either clowns or asylum patients, there is still some degree of variance in the costumes worn. There are some unique (and amazing) clown masks spread across the haunt, many that seem to have custom paint jobs. Makeup in general is less prevalent, but when used by the clowns is typically spot-on. Too, some of the inmates at the asylum had some dramatic makeup affects going on. A number of the clowns have some detailed, head-to-toe costumes. The clown in the “Scooby room,” for example, is a prime illustration of this. The little bunny also showcased a nicely done bit of costuming and makeup paired together. The Carnival of Horrors is a great place to visit. With the exception of the Wicked Woods, all of the haunts should be easily navigable by a wheelchair or crutches. There are plenty of signs and designated walkways once you’re past the ticket booth accompanied by a voice over explaining the site and rules of the haunt. Special instructions and warnings are posted at the start of each themed haunt and on the back of the tickets. The attraction, set inside a music venue, is at a remote location from the road and there’s not a lot of lit signage. However, since this venue isn’t a permanent home, the haunt doesn’t have a great deal of control over this. Just look for the music venue and keep driving until you find the parking lot attendants. From there you just have to follow the sounds of screams. There is a lot of walking involved in visiting the Carnival. We recommend wearing comfortable shoes for your travels with the Carnival and its denizens. The Carnival of Horrors does very well within the confines of what they have to work with. Internally, there are some great facades and entryways for each of the individual haunts. Too, the aforementioned recording describing the rules is accompanied by screams and other sounds to get you hyped up for the haunt. However, the expansive venue parking lot and the venue’s ticket booth are rather mundane and plain. Even if clowns aren’t your thing, there’s still some neat special effects in the Carnival that can deliver entertainment and creepy wonderment. From the sound effects in the Wicked Woods to the steps and water in the 3-D house to musical clowns in the queue line, there are tons of details and unique effects to entertain visitors. Each of the small attractions seemed to have its own specialty that it did well; there could have been more effects, but with the space provided for the haunt, it would be a challenge to squeeze in more without some effects bleeding into nearby scenes. 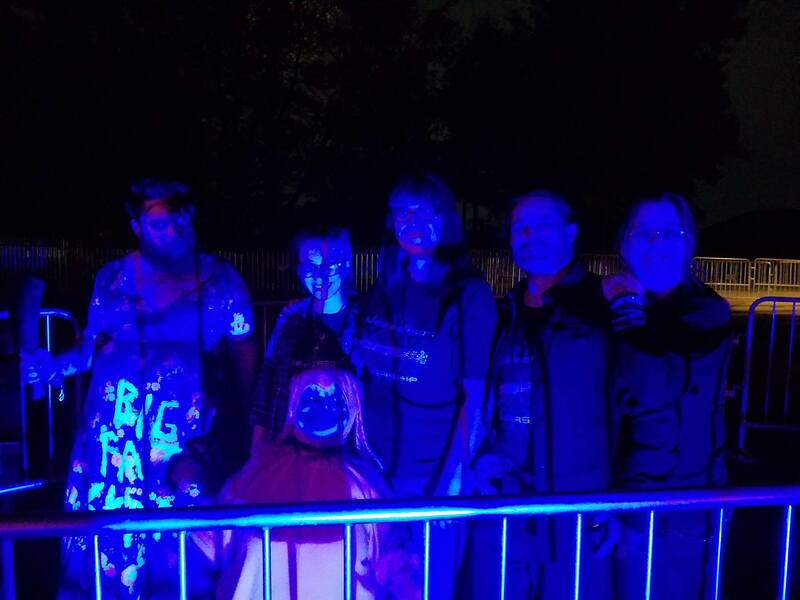 The Wicked Woods provided personal lighting (a single flashlight per group) and there were unique sounds playing through the area that made your journey through the woods a realistic one. We had to stop and look around several times for falling trees, and the rattling of chains (of escaped clowns? or their victims?) was ever present. The mazes of the Fun Houses were amazingly minimalistic. The 3-D Freakshow had neat lighting effects that went beyond just the standard 3-D paint, though the 3-D paintings are good. There are lots of little details that help bring you into the theme and mood of the haunt to create an immersive experience unique to the Carnival. It should also be mentioned that the first attraction, the Fun House, heavily uses strobe lights. 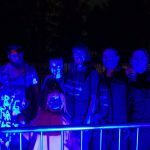 They’re used to create some great effects, but if you’re overly sensitive to strobes, you should be a bit wary (this is mentioned in the warnings posted before the haunt and on the tickets). 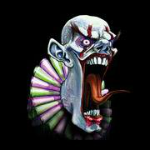 The Carnival of Horrors, as mentioned, focuses upon a funhouse, carnival, psycho clown motif and carries it through the entire haunt. Though there are smaller attractions within the haunt, and each of those focuses down on one smaller theme, the whole haunt deals with clowns and madness. If you feel a need to go ‘full clown,’ then this is the haunt to drag your friends off to. We’re not clowning around when we say that the Carnival of Horrors has some serious scares in store. Adept at distracting and disorienting visitors, the Carnival haunters make your time inside seem to stretch on and on. Each of the nooks and crannies was complete with its own clown. There are also enough things going on to provide some startles and frights even if clowns don’t disturb your innocent and fragile soul. If you’ve got the time, plan a visit to Carnival of Horrors. There are numerous mazes and loops that can get you turned around and disoriented, so while we made it through relatively quick, there were others who entered before us but wound up not coming out until some time after. Though the confusing mazes might lead to a bit of anxiety or nervous tension, we recommend letting yourself get lost and enjoying it. It took our group 34 minutes to go through all attractions but again, this will depend on maze time. Discounts for online purchases, coupons available, discounts for large groups (20+).